Comics In 5 Panels: Manga-Mania May: Otomen. Asuka Masamune is the most popular guy in his school. He is good-looking, has good grades, is the captain of his kendo team, popular among the girls, and pretty much everyone likes him. ..Yep, he hates his life. 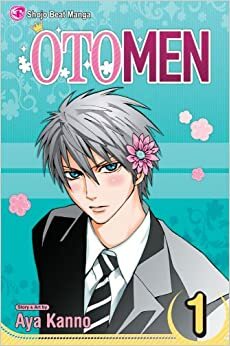 You see, behind his "manly" image, Asuka is a otomen, witch means that he enjoys sewing, cooking, stuffed animals, shojo manga, and pretty much everything that can be seen as "girly." But since his mother is homophobic as hell(Asuka's father left the family, wishing he was a woman), Asuka does everything he can to stick to his mother's idea of what a man should be like. ... Ryo is by the way a girl, not a guy. Besides the romance, the story also has, like all good mangas, many great characters, such as Asuka's friend Juta who plays the role as matchmaker for Asuka and Ryo, so he can get material for his shojo series, witch Asuka, ironically, is a huge fan of. And my friend Arselan's favorite character is Kitora, who has a unhealthy interest in flowers(his girlfriend broke up with him, once he told her he loved flowers more than her). Another great element is that in this little romance, the roles are reversed, so to say. Asuka is the stereotype shojo girl, girly as heck, and very timid. Ryo takes the role as the guy, tough and headstrong, but also REALLY slow at getting that Asuka loves him her. And then it's also the classic tale about the fear of being who you truly are. Sweet story and good art by Aya Kanno. My favorite shojo series at the marked right now, and I cant wait to get the final book that's on it's way. That's one down, 19 to go.